Helen Henderson passed away October 29, 2018 at Hopewell House in Portland, Oregon after a long battle with cancer. She was 94. Helen was born January 30, 1924 in Gaston, Oregon to Siegfried and Nona (Pritchard) Wyss as the oldest of five children. Helen grew up in a hard working family of farmers and loggers that lived in several places in Yamhill County. 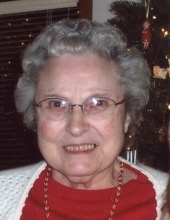 She attended schools in Gaston, Gopher Valley, Sheridan, and graduated at Willamina High School in the class of 1942. She then took a job as a secretary at the Courtemanche Tire store in McMinnville during the war years. Later, she went to work as an insurance clerk at General Hospital/Physician’s Medical Center in McMinnville where she spent the rest of her working career. She married Thomas Henderson on November 11, 1950 in McMinnville, Oregon. They were married for 53 years and raised three sons. Helen enjoyed all types of travel. She had a passion for visiting Europe, especially her father’s home country of Switzerland. She liked seeing the world from various cruise ships with her family. The Oregon coast was a preferred automobile destination. Her husband, Tom in 2003, preceded Helen in death. Also, her four siblings: Siegfried (Bud) Wyss, Alfred (Jack) Wyss, William Wyss and Marie Minton. Surviving are her three sons, Mike (Mary Lou) Henderson, Scott Henderson and Craig Henderson, seven grandchildren and ten great-grandchildren. Services will be held at 10:00 am. Saturday, November 3, 2018 at the Chapel of Macy and Son, McMinnville, with interment at St. James Cemetery. The family is requesting, in lieu of flowers, a donation to: Legacy Hospice, 2275 NE McDaniel Lane, McMinnville, OR 97128. To send flowers or a remembrance gift to the family of Helen M. Henderson, please visit our Tribute Store. "Email Address" would like to share the life celebration of Helen M. Henderson. Click on the "link" to go to share a favorite memory or leave a condolence message for the family.